Tucked away on the side of Hurricane Mountain in the Adirondacks, two Dickinson Farm graduates are making their mark on local agriculture, food, and art. 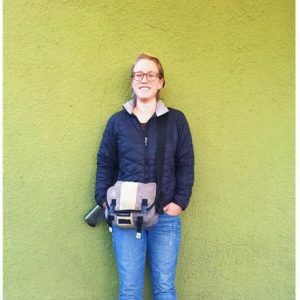 Megan Moody (’13) and Lizzie Wilford (’16) are part of the inaugural team at Craigardan, a new initiative to establish a collective of growers, thinkers, and creators that are striving to make a positive impact on the greater community and the environment. 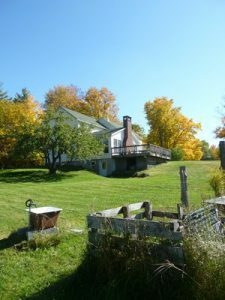 After graduating Dickinson with a degree in Environmental Studies and three growing seasons at the College Farm under her belt, Megan pursued a career in farming first at friend’s small operation in Vermont and then at Essex Farm in the Adirondacks. There, Megan fell in love with the region while honing her livestock-raising and butchery skills, gaining a greater appreciation for the value-added market both at Essex and as the manager of a small farm to table café. While Megan was spinning tractor wheels in upstate New York, Lizzie was spinning ceramic wheels back in Carlisle. Lizzie Wilford (’16). Photo courtesy of Craigardan. 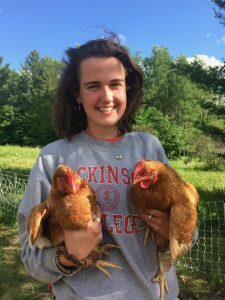 A Studio Art major and 2016 graduate, Lizzie didn’t start her career with the College Farm until after graduation when she took a position as the farm’s Education and Outreach Coordinator. It was through this position that Lizzie and Megan connected, when Lizzie reached out to conduct an alumni interview much like the one you are reading now. Upon finishing her year-long contract with the College Farm, Lizzie joined Megan in New York in June 2017 where the two now live and work side by side in Craigardan’s fields. Megan Moody (’13). Image courtesy of Megan Moody. As two wildly talented and artistic farmers, we are anxious to see what this dynamic duo will accomplish. Both credit Dickinson with incubating their passion for farming and teaching them how to create—both food and art—with their hands. Furthermore, these lady farmers are perpetuating a long line of Dickinson female agriculturists. Not afraid to give anyone a piece of their mind, but also cognizant of their abilities and limitations, Lizzie and Megan are setting an admirable precedent for aspiring farmers, artists, and educators. Though Lizzie and Megan’s long-term goals are still evolving, they both aspire to lead by example. Lizzie’s ultimate goal is to become a successful homesteader; living in home built with, eating food grown with, and eating off of plates thrown with her own two hands. While Megan’s immediate future consists of further developing the farm at Craigardan, she hopes to continue traveling and learning from farmers around the world during the winter months. But for now, Lizzie and Megan are happy to be right where they are: eating ice cream for dinner, cuddling with farm dogs, and learning from each other and the land. One Response to "Alumni Spotlight: Megan Moody ’13 and Lizzie Wilford ’16"